Specs at the ready. Magnetic eyeglass hanger. Never fish in your handbag for eyeglasses again. 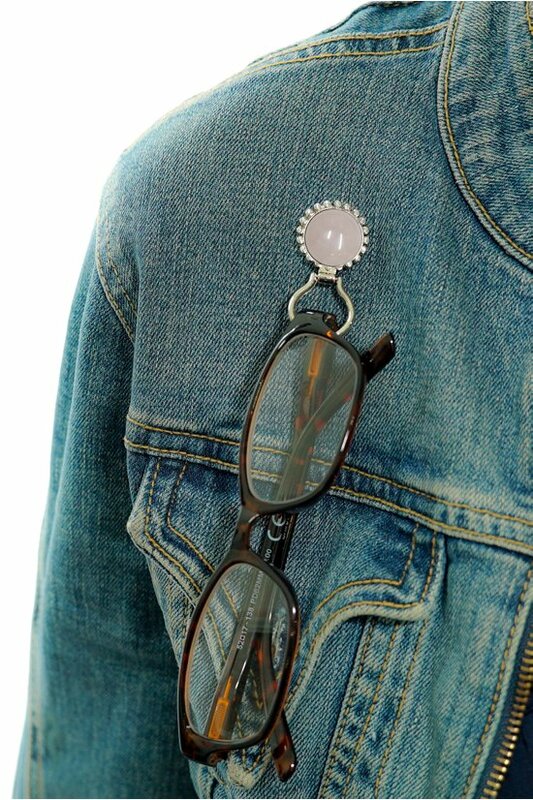 Magnetic hanger secures your glasses on the front of any shirt or jacket keeping readers and sunglasses easily within reach. Damage-free and safe for all fabrics, even fine silks. Remove the magnetic backing from the hanger. Place the decorative hanger on the front side of your blouse or jacket. Once you have it placed in the desired location, place the magnet under your shirt/jacket beneath where the accessory is located. The magnet will automatically attach to the backside of the eyeglass hanger. Once that's in place, your accessory is ready to use. Simply slide your specs through the opening on the front and go! Made from zinc alloy and rhinestones. Magnetic field- Can be harmful to pacemaker wearers.